Yes. I am an artsy girl but i have absolutely no musical talent what-so-ever. I think i might remember how to play "mary had a little lamb" on the recorder. However, music is still a big part of my life. I like blasting tunes with my friends with the windows rolled down in my car. Listening to music is a way to escape from my stressful-homework-studying-high school-life. My taste in music is kind of all over the place... I really enjoy any artist with creative lyrics. I ♥ OneRepublic, Regina Spektor, John Mayer, Train, Sugarland, Rascal Flatts, Joshua Radin, Jason Mraz, Mumford & Sons, MGMT, Coldplay, Michael Buble, Kenny Chesney... the list is never ending!!!!!!! Taylor Swift is one of my faves of all time. 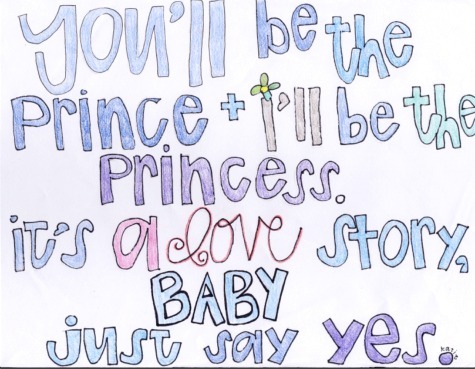 Her lyrics are magical. I also love her bubbly personality. She is a good person and i think it is so cool how she is the one writing all of her songs. Her songs are inspirational for me because they are happy and relate alot to my teenage life. Her new Speak Now cd is love. I have memorized every single song on it. P.S... I am lovin this whole blog thing!!! Finally getting the hang of it. P.S.S.... OH! And i loooooooove getting comments! It makes me feel like im not talking to myself! Just sayin'. Over and out. I seriously can't get enough of your blog! I had trouble sleeping last night, and i was so happy to find in the middle of the night that you made a new blog post about this weekend! I also love this post! 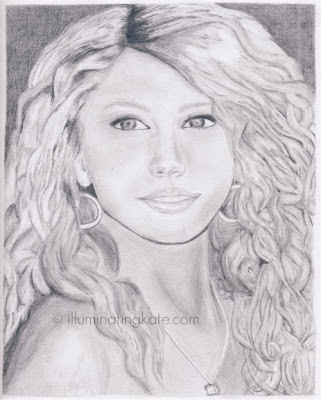 I gotta say, for someone who can't play any instrument, you sure know alot more about music than i do... Also, as i've told you before, your portrait of T-swift is AMAZING!!! Well, I share your taste in music, so I guess I've still got it going on. Who says 40 is old? You are so talented. That portrait is fantastic. You should send little Miss Swift a copy of it! Hahaha of course you do! Thank you sooooo much! You are so sweet! I think i will try to send it to her! Holy Moly girl, that portrait is fabulous! I can't wait to visit your gallery someday:).